Though a significant change is visible regarding helmet use by bike users in the capital, experts think the protective gear many passengers of ridesharing services wear are awfully unsafe and substandard, reports UNB. Amid the enforcement of law for ensuring the helmet use by the bikers following the students' 'Safe Road' movement, some ridesharing companies, including Uber, Pathao, Obhai and Shohoz, provided helmets to their riders, but police said most of those are just caps what the construction workers use. 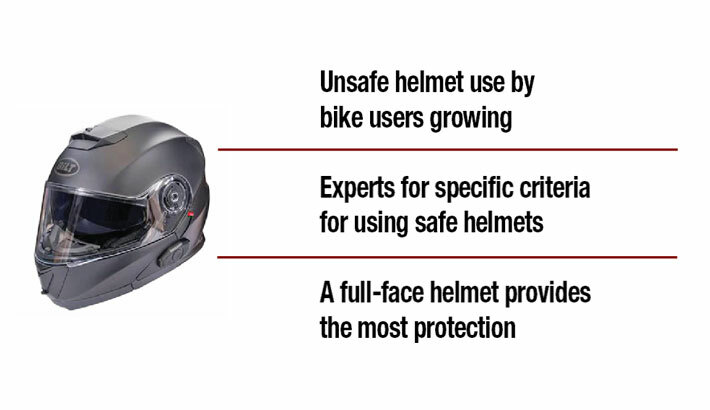 Transport and urban experts said the government should fix specific criteria for using safe helmets and imposing a ban on importing substandard helmets and their use by bikers to ensure their safety as the number of users of the two-wheeler is growing fast. Currently, motorbikes constitute around 60 percent of the country's total vehicles, officials said. Talking to UNB, some passengers of ridesharing services alleged that the helmets they are given by the bikers are below the standards and not capable to protect their faces and heads in case of any accident. They also said most bikers use better helmets than ones they provide their passengers, and most of them keep the ordinary helmets only to show the law enforcers that they are abiding by the law. "Though the ridesharing companies gave their driver partners helmets, they hardy use those and give those their passengers. In most cases, we see bike drivers give their passengers very low quality, dirty and poor quality helmets," said Abul Kalam who often uses the service of UberMoto and Pathao. Sadia Trina, another user of UberMoto and Pathao, said the helmets provided by both the companies are very light and poor quality which cannot properly adjust to the head. "As I wear spectacles I find it difficult to wear the helmets the bikers provide. I think such helmets are not safe. It seems to me the bike drivers keep name-only helpmates only to avoid punishment by the police, but they don't understand its importance." Despite repeated requests for comment on the issue over phone and through email, the Uber authorities did not responded, apparently showing their apathy to the serious passenger safety issue while the Pathao spokesman could not be reached over phone. Contacted, DMP deputy commissioner (traffic-west zone) Liton Kumar Saha said they are seriously worried over the safety of the passengers of ridesharing services as they use toy-type low-quality plastic helmets. "Most of the helmets the passengers of the ridesharing services use are made of plastic which usually wear the construction workers. The poor quality helmets can't protect the passengers in case of any accident," he said.